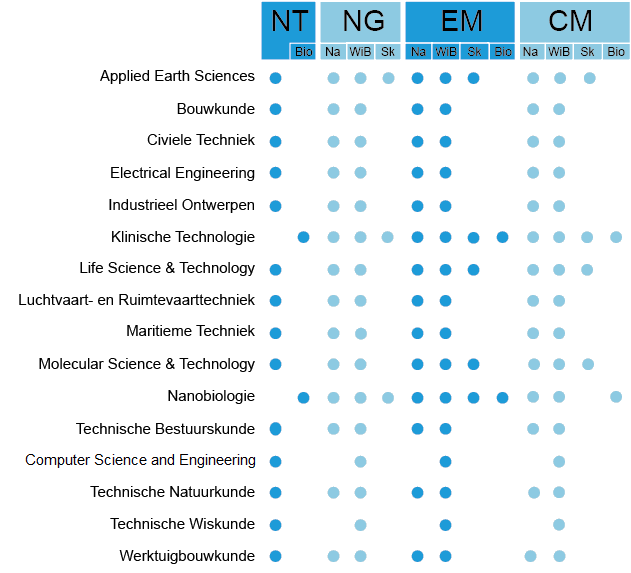 In order to start a TU Delft programme, you may need to take some extra courses(deficiencies) to complete your profile. For a VWO-Diploma there are 4 profiles: NT, NG, EM, and CM. Please see graphic. These deficiencies are intended to compensate for gaps in your Vwo education. All deficiencies must be eliminated to start a programme at TU Delft. There are several institutions that can help you with this. Click here for more information about deficiencies. Mathematics, applies to all Bachelor's programmes. Physics, applies to all Bachelor's programmes with the exception of Computer Science and Engineering and Applied Mathematics. Chemistry, applies only to Applied Earth Sciences, Life Science & Technology, Molecular Science & Technology and Nanobiology. Biology, applies only to Nanobiology and Clinical Technology. Deficiencies are required courses/subjects missing in your previous education necessary to gain access to your study programme. Prospective students can be deficient in mathematics, physics and for some educational programmes, chemistry and biology. Deficiencies can be eliminated by successfully completing courses at one of the following institutions: Voortentamen, Boswell-beta, Korteweg-de Vries Institute for Mathematics and Wismon. Please contact the institution for more information or to register for a course. - 15 July : for Numerus Clausus programmes. Please see the Numerus Clausus programmes for more information. A certified copy * of your exam result(s) from required courses must be provided to Student Administration, Jaffalaan 9a, 2628 BX Delft before 15 July. - 1 September: for general programmes. A certified copy * of your exam result(s) from required courses must be provided to Student Administration, Jaffalaan 9a, 2628 BX Delft before 1 October. * A certified copy of the diploma or certificate is a copy on which an original authenticate stamp and a signature or initials of the institution. Your institution can give you a certified copy. It is also possible to make a certified copy at the desk of the Contact Centre with the original document. Are not directly admissible to a university program because of their diploma. Have a Dutch educational background and have sufficient communication skills in Dutch. The deadline for application for a Numerus Clausus programmes is 15 January (23:59 CET). After applying via Studielink and the TU Delft online application portal, you'll receive more information about the selection procedure. The outcome of the final ranking is announced mid-April. NOTE: Applicants applying for a Numerus Clausus programme may apply for one additional regular programme as a backup. The deadline for the backup application is 1 April (23:59 CEST). The backup application will only be processed if the applicant requests to withdraw the NF application and/or when a non-EU applicant hasn’t been offered a place by June 15. Want to know more about the selection and placement regulations? Please click here. General questions? Please check out our FAQs.